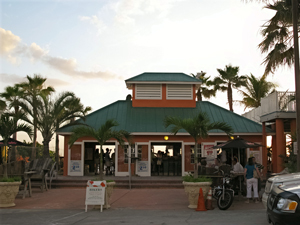 St Pete Beach bars offer a different nightlife venue for people who would rather listen to music and socialize (drink) instead of dance . There is quite a line-up along what the locals call, "The Miracle Mile" on St Pete Beach. 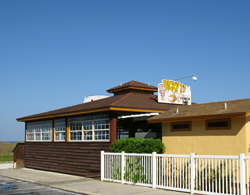 This stretch between The Swigwam at the north end (63rd Avenue/Gulf Blvd) and Flipper's Beach Bar on the south (49th Avenue/Blvd) is pretty much set for linear bar hopping. There is definitely a place for all tastes, manner of dress, drinks and food. We've found the service to be great at all of these stops on the Miracle Mile. If Florida beach bars had to nominate a role-model, this would be it. The locals start coming in about 3:00pm and everybody has a best friend by about 7:00 that evening. No shoes, no shirt...no problem. Kenny Chesney would think he entered Lyrics Heaven. The decor is Old Florida tiki, accessorized with vintage license plates and thick plank benches full of carvings and black magic marker wisdom. Music, beach volleyball, cheap drafts, and energy are the dominant themes here. 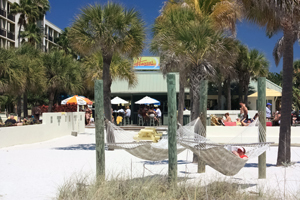 This is truly a St Pete Beach bar you want to experience. About 50 yards south...and several light years in clientele, Jimmy B's offers three different bars in spacious settings, all connected by wood boardwalks. There is live music and sports on large TV's. The menu is much more varied than you'd normally find in a Florida beach bar. There are plenty of chairs, but you'll see a lot of customers standing along the rails to watch the sunset. This place is friendly and upbeat. If you come from The Swigwam, pull on a shirt. Kenny Chesney would get tossed out of here. 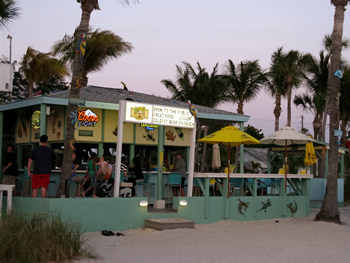 This little St Pete Beach bar belies its appearance, but we mean that in a good way. 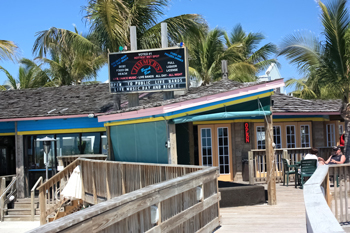 To view it from the beach or even the parking lot, you'd figure it for a full-tilt tiki dive bar...but the times we've been there, it has been quiet and pleasant even though there was a solid flow of people. The deck out back is small when you come from the spaciousness of Jimmy B's. Inside, there is good room and plenty of TV's so you won't miss a minute of Sports Center. The staff is very friendly and the service is quick. This is a nice little place. This is beautiful, classy resort beach bar. If Kenny Chesney was the tour guide at The Swigwam...this is where you'd find Barbara Streisand and Shania Twain. The drinks are far more pricey and the mood is more romantic than randy. Every shirt has a collar here. If you want serious together time with meaningful conversation, this is your place. Like I said, The Miracle Mile has something for everyone. To be truthful, it was hard to get a read on this little St Pete Beach bar. It is definitely for the older crowd. It is tidy, classic, and subdued. Everyone was friendly and the staff was great, but it seems more attuned to those who have been retired 10-15 years already. It is a beautiful, pleasant place to watch a sunset. Just make sure you bought your beachwear at Lands End. 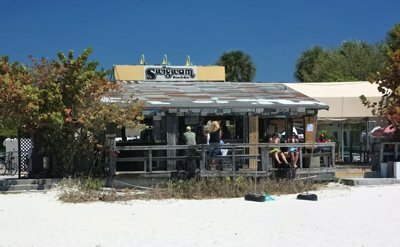 This St Pete Beach bar was boarded up and defaced with some poor graffiti. What a shame. We've heard from the locals that former Bucs Fullback, Mike Alstott was a regular here and that it used to be a popular place. Hopefully, good times return and it once again becomes a spot for bar hopping on The Miracle Mile. This is another resort beach bar. It is upscale and people order cocktails instead of a pitcher of beer. It can get real crowded in the summer, for some reason. Girls 22-28 easily find their way here. Lots of colorful, shorty sun dresses and designer sunglasses. There are two swimming pools and plenty to look at. Out on the beach is a huge water slide for kids. Just one more unique St Pete Beach bar on The Miracle Mile tour. Okay...now we're back in familiar territory. Outside seating, hammocks if you down a few too many, a Jaegermeister shot machine, and good music. A great staff and excellent service only add to the experience. 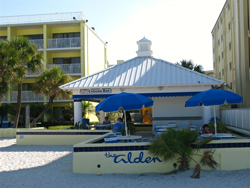 This is a St Pete Beach bar with classic looks, but a party atmosphere. Casual dress here does NOT mean cutoffs and muscle shirts with obscene words. It seems like most of the people here are in the 30-45 age group. This used to be named Bahama Mama's and is out in back of the Grand Plaza Hotel . We've had some great times here and the food was good. You can view both a sunset and outdoor weddings if you get a seat on the north or west sides of the patio. Otherwise, you'll be looking at a blacktop parking lot. A live band shows up at times. The bar is well-stocked and the staff is friendly. We've seen a group of young women in nice sun dresses sitting next to a table of 30-something fishing buddies fresh from the Gulf. It is a great mix of folks at this St Pete Beach bar. This is the last St Pete Beach bar on the Miracle Mile bar hopping scenic tour. Fittingly, it is located in a resort. This is from a different universe than The Swigwam back where we started. Flipper's is upscale and classy. The decor is rich and there are maps embedded in the bar. The music is very good and not loud. Once again, this place caters to mostly retirees and there can be some intense shuffle board games on the courts outback. It is a relaxing place and easy to sit back with someone special to watch a sunset. The Undertow Beach Bar is not part of the Miracle Mile of beach bars, but its good-looking waitresses serving food and beer in bikini's make it a hit on St Pete Beach. This place gets packed with locals on the weekends. The crowd is mostly 25-40, although local retirees mosey in here, too. There are actually two crowds. One comes in for dinner about 5:00pm and stays until sunset, then heads out somewhere else. The second wave comes in about 9:30pm and stays until closing. 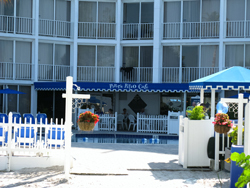 The Undertow Beach Bar also serves an excellent breakfast...just in case you wake up on the beach.